We are delighted to see that our wines performed well again in this year’s Decanter World Wine Awards! We are especially excited that our Shiraz-Lefkada 2013 received 91 points; the patience to age this wine a bit longer in our cellar was rewarded. I discovered this salad a few years ago in one of my favorite cooking books* and it quickly became a ‘regular’ on the Zambartas’ family table. It is a perfect side dish or starter for a bbq party, but also delicious on its own for a light summer lunch or dinner wit a glass of Rose. The mix of dades and almonds, which give the salad a sweet note, is perfectly balanced by the vinegard and lemon. The great thing is that all ingredients are readily available in Cyprus, as they are essentials in the local cuisine! Put the vinegar, onion, and dates in a small bowl. Add a pinch of salt and mix well with your hands. Leave to marinate for 20 minutes, then drain away any residual vinegar and discard. Meanwhile, heat the butter and half of the olive oil in a medium frying pan over medium heat. Add the pita and almonds and cook for 5 to 6 minutes, stirring all of the time, until the pita is crunchy and golden brown. Remove from the heat and mix in the sumac, red pepper flakes, and 1/4 teaspoon salt. Set aside to cool. When you are ready to serve, toss the spinach leaves with the pita mix in a large mixing bowl. Add the dates and red onion, the remaining olive oil, the lemon juice, and another pinch of salt. Taste for seasoning and serve immediately. Enjoy it with a glass of Zambartas Rose! 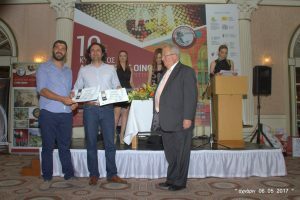 We received 2 silver medals at the 10th Cyprus Wine Competition, held from 3-5 May in Paphos. Over 140 samples of Cyprus’ wines were tasted by an international jury panel. Our Shiraz-Lafkada 2015 and our Xynisteri 2016 both received a silver medal. We were included in a travel story published by well known Swiss Newspaper ‘Schweizer Illustrierte’ together with TUI Travel group. A lovely article showing Cyprus’ true nature and tradition as well as its modern vibe! Article with tasting notes and rates by Jancis Robinson, including our wines, following a tasting in London. A very interesting article by Dr. Jose Vouillamoz (co- author of Wine Grapes) on a recent visit to Cyprus about indigenous varieties, where Marcos invited him to see our ‘Margelina’ vineyard from 1921.